I almost dedicated my life to writing simply because I an an introvert, an observer, and the survivor of a very unusual, almost tumultuous childhood. I was never ever interested in athletic or sporting pursuits, and typically was the very last person selected for pick-up games during grade school recess. Throughout my childhood, while all my friends sought social interaction, I chose to be alone, reading books, visiting museums, going to the library, and exploring. My parents believed in free-range parenting, allowing me to go and explore the world on my own, as long as I returned home on time. It wasn’t until later on in early adulthood that my parents started a bizarre scheme to try and control every facet of my existence when I was in college. I almost dedicated my life to writing after my first year of college, having been unable to find any love interests who shared my passion for writing, though regardless, my parents never thought anyone I was interested in having a relationship with was ever good enough for me. I often thought of myself as being crazy, as if I were simply a lost man in an even more lost world; from the very beginning, I would often compile multiple pages worth of writing in my head, as well as mentally rehearse a dialogue as if I were watching a movie where I were cast as the main character. There were times in which I would agonize, often for hours at a time over simple things such as punctuation. I always felt a connection with nature, and would sit at the base of the largest tree in the back yard of my parents house. I referred to the tree as my dreaming tree, and spent many countless hours at the base, writing, thinking, creating, and on a handful of occasions I climbed through the branches of its large canopy to gain a different perspective. The dreaming tree has since died, its once healthy branches have begun to fall to the ground. I almost dedicated my life to writing, though I kept many thoughts and ideas to myself, never writing them down, fearful that the contents of my head might one day become justification for psychiatric hospitalization. I almost dedicated my life to writing, convinced that I was insane, but I realize as the years go by that I am, in the simplest of terms, I’m not crazy, I’m just a writer. The header image was designed using Canva. This piece took almost an entire year to get written. It wasn’t that it literally took a year to write these words, it was more of an issue of simple procrastination. Is it theoretically conceivable that our creativity is a direct derivative of what we experience in life? Are our ideas and imagination nothing more than an adaptive mashup of that which we have already seen? 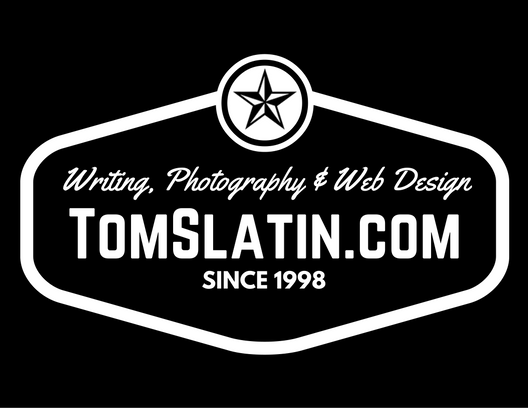 TomSlatin.com — online for 20 years! © TomSlatin.com / Thomas W.P. Slatin. All Rights Reserved.